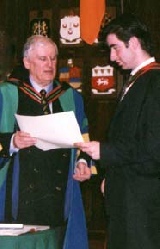 The Saor-Ollscoil na hÉireann is an independent tertiary education institution and makes awards in the Liberal Arts at BA, MA and PhD levels. The Saor-Ollscoil is open to students over 20 years of age who have a love of learning for its own sake and a wish to develop their capacity for logical reasoning and clear thinking. Places are offered to students through an informal interview process. Apart from basic literacy skills, the main entry requirement for a student is a commitment to the approach of Saor-Ollscoil as set out in its philosophy. Saor-Ollsoil na hÉireann has an open and flexible system of accreditation designed to suit the needs of mature students, who work at their own pace to earn their degree in a minimum of three years or longer at their own choice. The Bachelor of Arts degree is awarded on the basis of a minimum of fifty credits. This is based on a mix of course work and credits awarded for the thesis. The student aims to accumulate twenty-five or more credits from course work over a minimum of three years. It is recommended that a student take two or three courses per year. A maximum of five credits is awarded per course. The credits are awarded for a mix of presentations, essays and attendance at class related activities, including field trips, seminars and the annual summer school.